For those unfamiliar with the cult of Japanese anime, Evangelion is one of the better known of the early series and characters. The full title of the show which first broadcast between October 1995 to March 1996 was Neon Genesis Evangelion and it tells the story of a post-apocolyptic earth in the early 21st century. 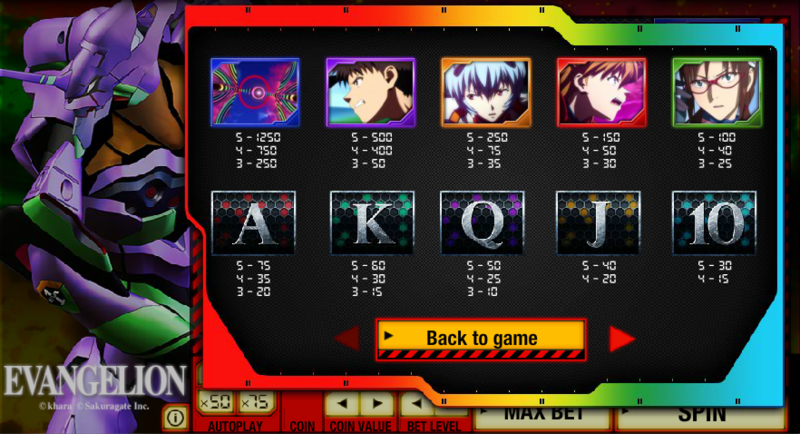 Evangelion is a brand new online slot from Random Logic and available to play now at 888 Casino; the first thing to say about this slot is that it looks great – with particular reference to the artwork which brilliantly captures the anime style of the mid-1990s. 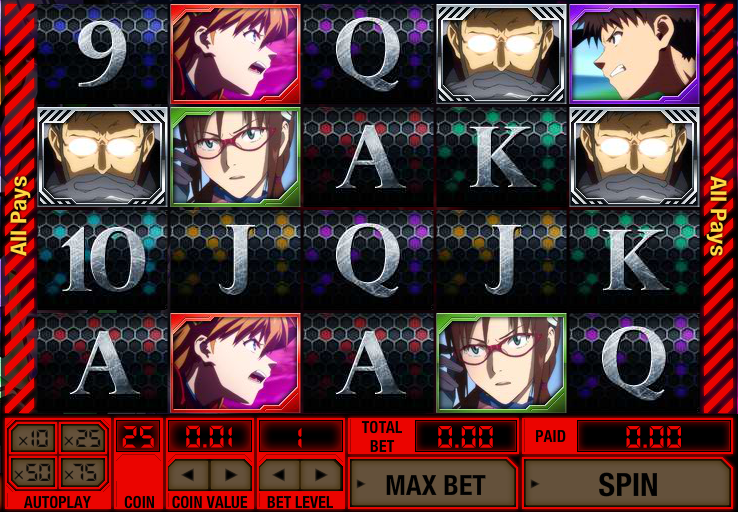 Anime shows can be particularly complex but a slot machine is simpler by necessity. Aside from the 9, 10, J, Q, K and A, the symbols are represented by characters from the story and we’re going to have a bit of stab at the names and say they are the children Shinji Ikari, Rei Ayanami, Asuka Langley Soryu and Toji Suzuhara. The bad guy could be the head of NERV, Shinji’s father Gendo Ikari. Gendo Ikari is the scatter symbol, there’s a red wild and also a penguin bonus symbol which only appears on reel three. There are no paylines but combinations will pay as long as symbols are in adjacent reels from left to right. During the free spins each of the main characters becomes stacked, which means that they are large enough to stretch over the entire reel. This increases you winning chances. Id you’d like to see a penguin moving around in a strange way, try and activate this bonus; the penguin only appears on reel three and if you can land him there he will award a cash win. Firstly, just enjoy this slot for the great anime artwork; after that we recommend playing with a medium stake to try and trigger the free spins while maintaining a healthy coin level should you win big. We were always fans of Japanese anime and were of course excited by the prospect of this slot; it didn’t disappoint and it’s quickly become one of our current favourites. The music is bang on and the graphics take you back to the heyday of anime – some nice bonus features finish it off nicely.